Amanda and I first met members at the club when we visited our first BKKS National Show, in 2010 and we met the club at the dinner dance event on the Saturday night of the show weekend. Some years later... we’ve got to know the club and the members a little better over the last few years; I’ve visited the club twice giving talks on club nights. 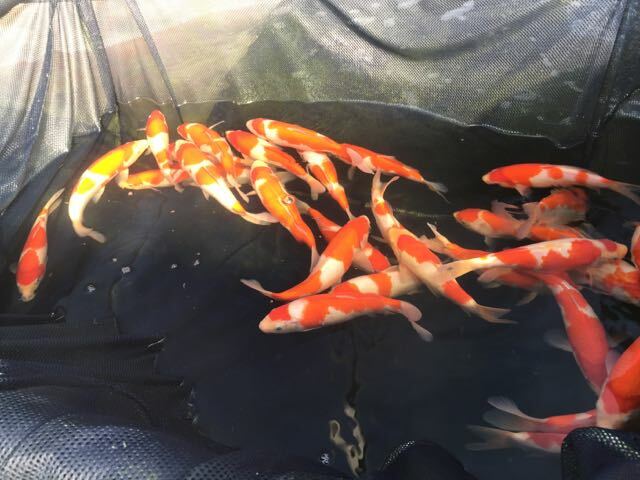 And also a couple of the member had purchased fish from us. 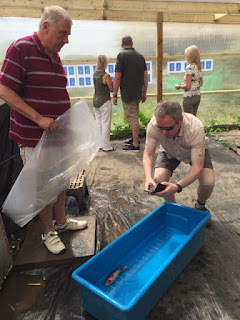 One of them, the club chairman Andy Finch, picked up tosai from the Sharkey 2016 spawning last summer, had gone on to win some notable prizes at the club’s 2017 Garden show with his Byer Kohaku purchases. And I think that helped to spark interest at the club in them all coming over to visit.. .. We are also very excited that they also requested that we supply their grow and show competition this year... We appreciate the vote of confidence in our fish, and it also provided a focus to the visit and it's going to be fascinating for us to see how a batch of our tosai this year (mostly from the 2017 'Rosie' spawning) would fare in the club members ponds. Before the club visited… I needed to have sorted through all my tosai, so that I could make my aka nisai selections (ie, decide on which tosai I wanted to grow on for one more summer, to nisai age) before working out which fish I was happy to let go to the club’s grow and show competition. We were so busy during May, that it wasn’t until the day before their visit that I started my tosai selections. I cleared the day, and set about selecting through all the tosai tanks – and that was a few hundred tosai, spread across 3 separate tanks. One of the guys at the club.. Paul Tinker, had previously offered us some help to prepare for the club’s visit.. and to arrive at ours on the Saturday. We gratefully accepted the offer. And he arrived early afternoon, along with 4 additional club members… Andy and Denise Finch, and Mark and Vicky Wall. When they arrived, Amanda and I had selected through 2 of the 3 tanks, and then for the final tank, Andy and Mark joined myself and Paul to help select through that tank. I really appreciated the extra help for that last tank – which was the most awkward to seine net. In the selection, I was separating out the tosai I wanted to grow to nisai, from the ones I wanted to sell. And I also split the ones I wanted to sell by grade. In this pic, you can see Amanda, Andy Paul and Mark helping us with the selection. The extra pairs of hands helping to make light work of moving fish between cage nets. Once all the tosai selections had taken place – we started a second tranche of selection, to collate a batch of 30 tosai that the club could select from on the Sunday for their grow and show. We photographed and measured each one as they were selected, and then moved them into the tank which sits in our new polycarbonate building. That building is coming into it’s own… providing shelter and a little shade too. And it worked brilliantly for the grow and show selection. My daughter processed all the photos and printed out a4 sized prints showing all the fish in the batch and we mounted them on the wall – to help the members orientate themselves around the 30 fish in the tank. On the Sunday, the rest of the club arrived. And many had come from 3 hours and perhaps even further away to visit us. We put on some light bites.. the trusty bacon rolls which always works well as koi club fodder. 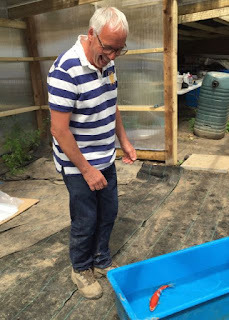 Followed by a tour round our farm..
Then, onto the grow and show competition. I was asked to provide some introductory words… and I explained the provenance of the fish, and also what I was looking for in development. We gave the members 45 minutes to peruse the tank before starting, the process where each member selected their fish. 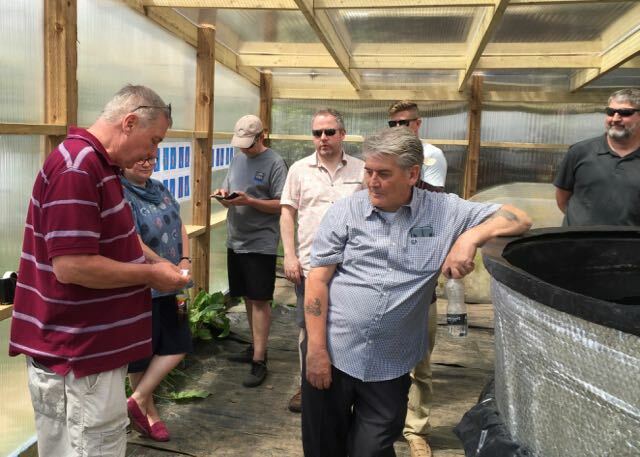 The grow and show members selection is basically a process where each member takes a turn to select their fish. 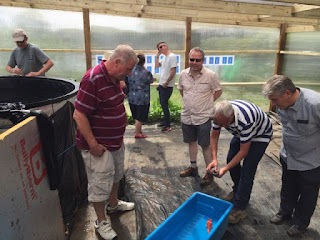 They take the fish home, grow it for a year and then the end results are judged and prizes awarded for things like, best growth, best development and so on. The club have asked me to judge the results, and to help the members understand what I am looking for, I took the members to our nisai tank, and showed them an example of the type of body I was looking for in a nisai - and that they should be aiming at developing in the tosai they were about to select. Names were drawn out of a hat to set the selecting order, and then the member was given 4 minutes.. maximum...to make their selection. Denise was there with the stopwatch keeping us all to time. Many members knew which fish they wanted quite quickly. Others took the full 4 minutes before making their selection. Michael Tipton, looking very relaxed in this photo - with the knowledge that his name was drawn first and he spent no time in deciding on taking the 4 step kohaku. A really lovely koi, with super red and pretty as they come! 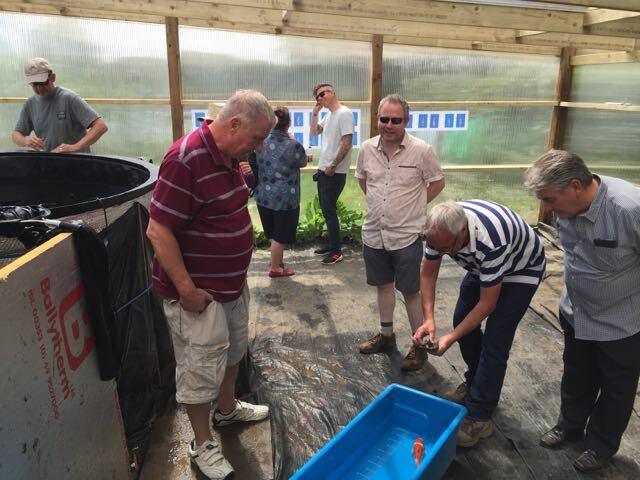 Here's some of the club members taking time to peruse the grow and show fish in the tank. 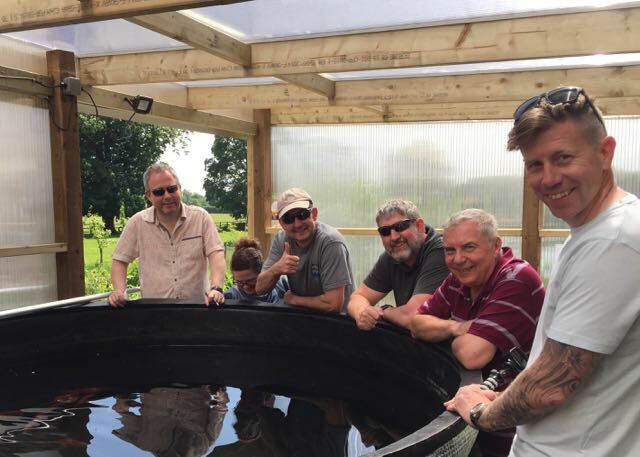 Once selected, the guys moved the fish into a blue inspection bowl where the new owner could see their fish close up and take pics and video…. Before the fish was bagged and boxed for the journey home. In the blue bowl, our tosai really stood out and it’s a lesson for me that we need to use that setting to properly show off our kohaku to visitors. Attributes like sashi and kiwa, and consistency of colour are much easier to assimilate in the blue bowl. Paul Tinker, particularly happy with his selection! Now, it’s up to the members to grow these fish on in their ponds for the next year or so. And, we are looking forward to seeing how they get on.